I love to get the "Pickles" new books - especially if those "new" books are off the thrift store rack. To my delight, they love getting new books. So of course, when the school announced their school book fair, I had to go. The "Pickles" already had books in mind that they wanted to get but since these were going to be full price, they were limited. The Boy usually goes for the "Ripley's Believe It Or Not" or "Guinness Book of World Records" choices. The novels he reads are usually acquired elsewhere or borrowed from the library. The Girl tends to want anything that has a cute picture on it (especially if it's an animal) so I try to influence her decision making as much as possible. I'm more interested in finding books that fit her current book collection. Otherwise, she's more likely to look at it once and put it aside never to read again. I definitely want to find the Little House on the Prairie book collection through Scholastic. The price is usually less than half what it is at major book stores ($19 vs $53) and I want to make sure The Girl has her own set. The set I got from my grandparents when I was 10 was so well read and worn that it has long ago been replaced (though I still owned the original set). We headed over to the book fair after school to have a look around. 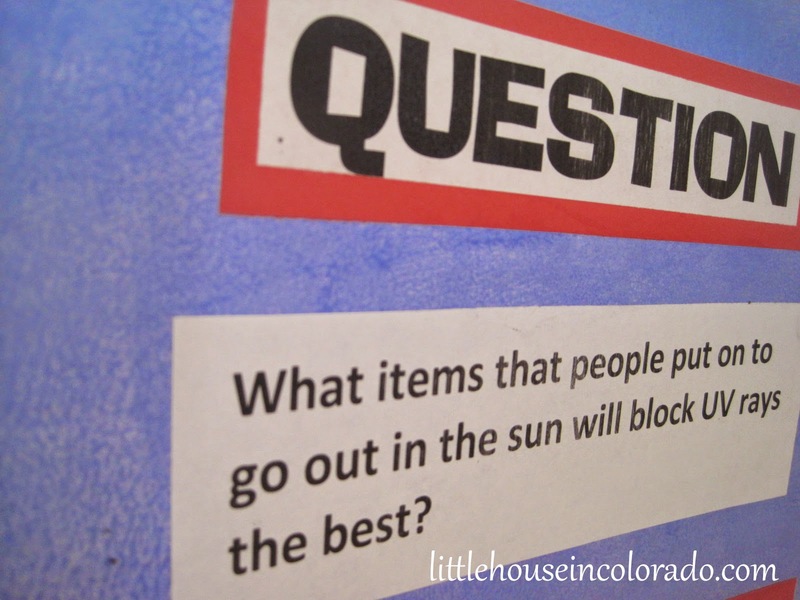 The Boy had already chosen a book called Tell me about Everything which is chock full of interesting facts about...well...almost everything from space, weather, nature, history, etc. The Girl, of course, chose a cute little agenda book with a picture of a kitten on the front. She would never use it for anything except to draw all over the pages. Since she enjoyed reading The Boy's Diary of a Wimpy Kid books, we chose Dork Diaries for her which looks to be similar in content but written from a girl's point of view. It's a little above her reading level right now, but that's not necessarily a bad thing. She only needs help with a few of the words. We also located a Rainbow Magic book to add to her growing collection. She usually finishes them in a couple days when she dedicates a little more time to reading. It was nice to come home and hear both children announce they were going to do their reading homework FIRST. I recently went through and re-organized my recipe book - the one I keep all my favorites in along with magazine clippings and printouts of recipes I want to try. I knew the original binder was getting a bit full (and old) because the rings were starting to separate from the cover and the vinyl was splitting from the cardboard. I went out and got 2 binders from the thrift store (gotta love the thrift store). One white and one black. In one, I placed all my favorites, the recipes we use over and over again as well as the ones we HAVE tried and would like to make again in the near future. In the other binder, I placed my ever-growing stack of "to try" recipes. That binder was already too full. I'd have to make more room. I told Mr. LH I was going to try to make at LEAST one new thing a week. Especially since just that day I had come across several new recipes I wanted to try. The recipes might be simple or elaborate. They might be a dessert, a sandwich, a simple sauce, a new bread or a full blown main course. I started out with the Homemade Poptarts then moved on to a Baked French Toast Casserole I thought I'd make when family is in town for Elder Boy's graduation (very heavy on the calories but so YUMMY!) That one got rave reviews from everyone. For one of Mr. LH's late nights at work (and with Elder Boy off doing whatever it is he does) I made Pepperoni Pizza Roll-Ups for the kids. This would be a great (FAST) weekend lunch. The recipe was actually from a grocery store mailer around Super Bowl time. Simply section out crescent roll dough, spread with about 2 tsp pizza sauce each, add 2-3 pepperoni slices on each and sprinkle with grated mozzarella. Roll up as normal and bake according to package directions (about 12 minutes). 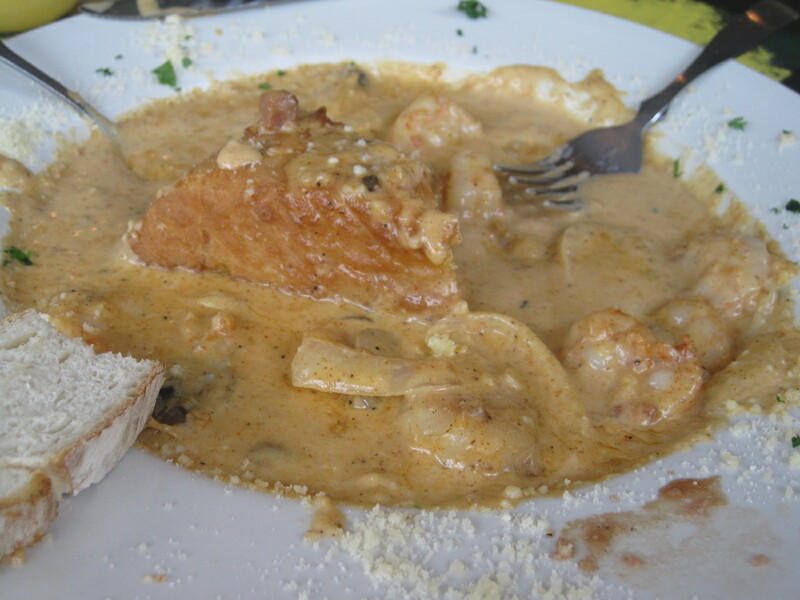 Next, I moved on to Shrimp & Grits. I don't know why it took me so long to actually make this dish, except I wanted to make exactly what Mr. LH got at a restaurant and had a hard time finding something similar. So YUMMY! Yep, you read that right...MAKE a poptart! My Sister-In-Law shared a recipe link for "Homemade Healthy Poptarts" and I absolutely had to give it a try...immediately. I had all the necessary ingredients and a couple hours to spare (okay, I was so excited about it that I MADE time for it). I also had some mango jam calling my name! We also tried these with Strawberry jam, cream cheese and jam, and peanut butter & jelly (or jam). The kids suggested peanut butter and honey (yum! ), and while I am NOT a fan of Hot Pockets, the thought of filling these with pepperoni and cheese did cross my mind. We now have a stash of these in the freezer - though they won't last too long. The Boy and Mr. LH are both taking them in their lunches. The Girl opted for a large rice cake (made fresh at the asian grocery store) spread with mango jam in her lunch box. Here is the original recipe for "Homemade Healthy Poptarts". I've also tried the recipe with both plain yogurt and with milk instead of the yogurt. The yogurt version was better and easier to work with. This makes a huge batch of dough! I split the dough into 3 balls and rolled each out separately. Definitely let the dough sit awhile! This made it MUCH easier to work with. Roll it out thin (and I mean THIN). My first batch turned out good but really too dry from all the dough. For the second batch, I made the dough thinner and they were much, much better. Jam vs. Jelly: definitely jam...or spreadable all-fruit. The jelly just seemed to melt and ooze out the sides more. With Easter just a week away, we had to make time to color the eggs! How lucky we were that a friend suggested we make it a gathering and all color eggs together. Easter egg dyeing is apparently a serious business to the kids. I haven't seen this much concentration in a long time! We did have one egg hit the table a bit hard...but the "Pickles" were happy to take care of that one. We had a great time and wound up with lots of beautiful eggs for the Easter Bunny (though I don't think they will last that long). The Girl has been preparing for the last month for a performance with her class in the school's "Variety Show". It's basically a talent show - one that her teacher volunteered the entire class for. They planned to sing "Lollipop" so we've all had that song stuck in our heads for weeks! All the children were asked to pitch in money for each child to have a large lollipop and to wear blue jeans and white t-shirts. Once her teacher got the lollipops, she must have given the class a talk about how "fragile" they were because The Girl came home that day spouting out a long list of "lollipop rules". After the dress rehearsal one afternoon, I picked The Girl up from school and she filled me in on her stage fright in front of "all those kids". The Girl and "stage fright" just do NOT go together. Is she already starting to get dramatic? I thought I still had several years before that "phase". Finally the night of the show came. From the crowd outside, you'd think this was a Broadway hit! How would they ever fit everyone in the gym? Once we finally made it indoors, we wondered again how everyone would be able to fit. Mr. LH and I were lucky enough to find 2 seats (that someone had stopped saving for people) and The Boy was able to grab a spot in front where children were being allowed to sit. They probably should have had 2 or 3 nights of shows just so everyone could enjoy the show comfortably. Although I had been battling a sinus infection for 2 days, I thoroughly enjoyed the show. Many of the acts were the usual school assembly song and dance routines. However, there were multiple acts done by individual kids or groups of kids showing off their talents. One act was even a father-daughter-son dance routine! MC #1: "Are those a bunch of retired teachers?" I've wanted a large mixing bowl for making my breads and such - something that would allow me to make a large batch and really get in there to mix it up. But large bowls in the stores just didn't seem large enough and they are always so expensive (how do I justify paying $30 or $40 for a BOWL?). I was at the thrift store twice weekly looking for one and finally came across one I liked. This beautiful pale blue stoneware bowl is 11 3/4 inches across and 6" high. It was part of a set, but luckily, they were priced individually because the 2 smaller pieces were flawed. Years ago, I fell in love with a set of dishes my dad and stepmom had. Apparently, it was a set she bought when she lived in NY years ago. She said her brother, who lived several states away at the time, had coincidentally also purchased the same set. In fact, it was a design that was manufactured between 1967 and 1983 called Madeira by Franciscan. A couple years ago when my parents were getting ready to downsize and move to a smaller house in Tennessee, I found that dish set amongst their other lifelong treasures piled in the garage ready for the auctioneer. There was no way I was going to let that set go. I staked claim to it then and there. Then they pulled out a box that had more pieces that they had picked up at a yard sale several years earlier. I was very happy with the set (and thank goodness Mr. LH also really liked it). Between my parent's original set and the second set they picked up from the yard sale, I had plenty of plates, bowls, saucers and mugs. I didn't think of expanding on it, and since it was such an old set and not "china", I didn't think it would be possible. Fast forward to our move to Colorado. Since Mr. LH was going to be in Colorado for awhile without the rest of us, I packed some dishes for him (no sense in buying more). I packed 2 of our bowls, dinner plates and salad plates for him. However, once I showed up in Colorado with the rest of the family, the bowls I had supposedly packed for him were missing. We couldn't find them anywhere. 2 months later, I was perusing a thrift store when I spotted 2 bowls...MY bowls. I snatched them up, paid $1.50 a piece for them and went on my merry way. I was so sure Mr. LH had left those bowls at his hotel and they wound up being donated to the thrift store. What luck to find them there! Fast forward to a couple weeks later. Same thrift store. I spot an oval serving plate, a large serving bowl and a creamer from the same Madeira set. Now I'm not so sure those 2 bowls I bought were mine to begin with, but so what! I've replaced the original bowls and am now seeing pieces of the set I never know existed! Since then, I have come across several more bowls and another creamer. I'm wondering why they don't just put the whole set out at once for sale...or maybe there are a number of people clearing them out of their cabinets? It is an older set so maybe people are just upgrading. Whatever the reason, I appreciate it. I am on the hunt for more serving pieces and the sugar bowl. I could get them on eBay, but I'd rather hold out to see if I can find them for much, much less. Who would have thought that I'd be scouring yard sales and thrift stores looking for specific circa 1970's brown dishes? 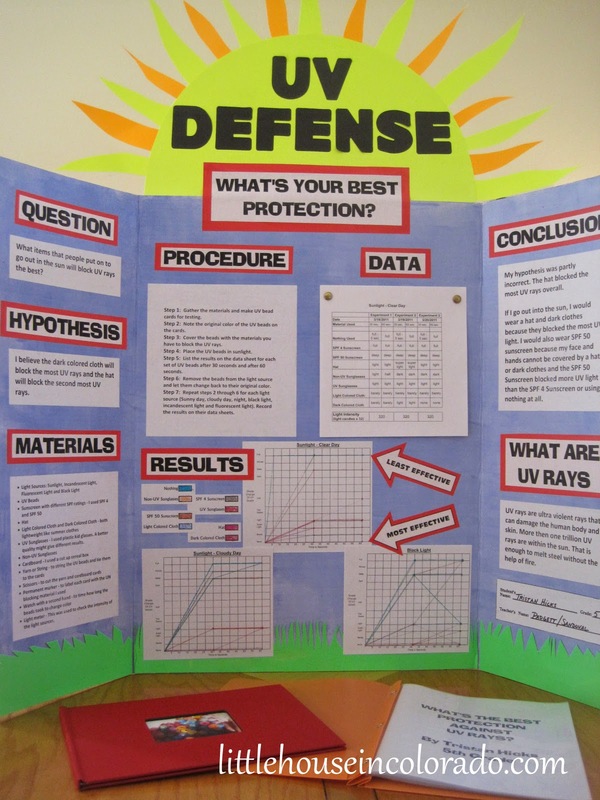 For weeks, The Boy and I (with occasional help from his siblings and Daddy) have been working on his science fair project. 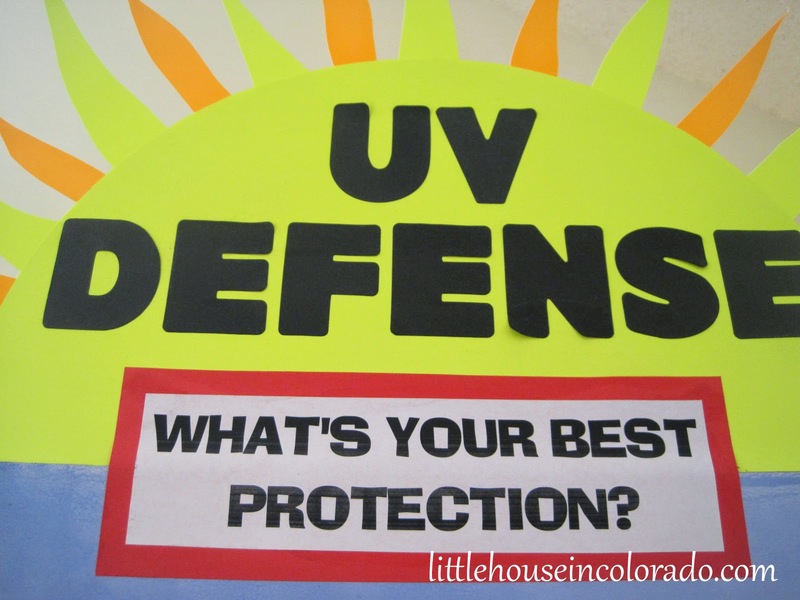 In review, he had chosen to experiment with UV sensitive beads to determine what items would best protect you from UV rays. We have actually been done with the experiment for well over a week and have been patiently awaiting some graphs I had ordered prints of (my laser printer is only black & white so I was hoping for a few color graphs). While we waited for the prints, we put together the rest of his display board. 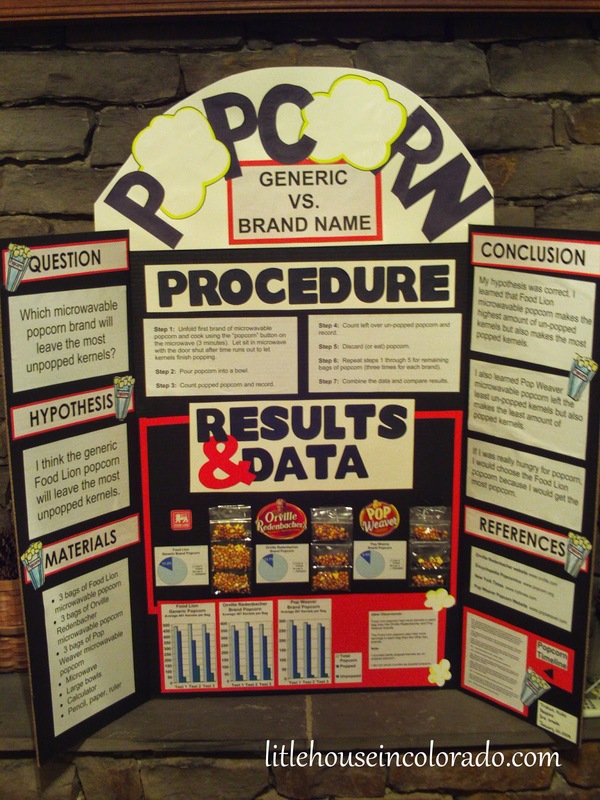 We had been very pleased with the way his Popcorn display board turned out for the science fair in 3rd grade (he didn't have to do one in 4th grade). He wound up with an Honorable Mention ribbon. That was a very fun project for The Boy - though we were eating popcorn for a couple weeks afterwards. We learned that not only did we get MORE popped popcorn from the generic brand, but we also preferred the taste of the generic brand, too (Food Lion's store brand). That board was black from the very start so creating an eye-catching display with black, white and red was easy. This time, though, we didn't have a clear picture as to what colors we would use and neither of us were pleased with the white background of the display board supplied (for a fee) by the school. We strayed from the "3 color rule" and just did what The Boy decided on - a sun, blue sky and green grass. We used acrylic paints and a roller to roll on the blue sky. It added some interesting texture to the board. We got some neon colored posterboard and made the sun using yellow and orange. The sun had to be big enough to display his title. We bordered the base of the display with "grass" using the neon green. 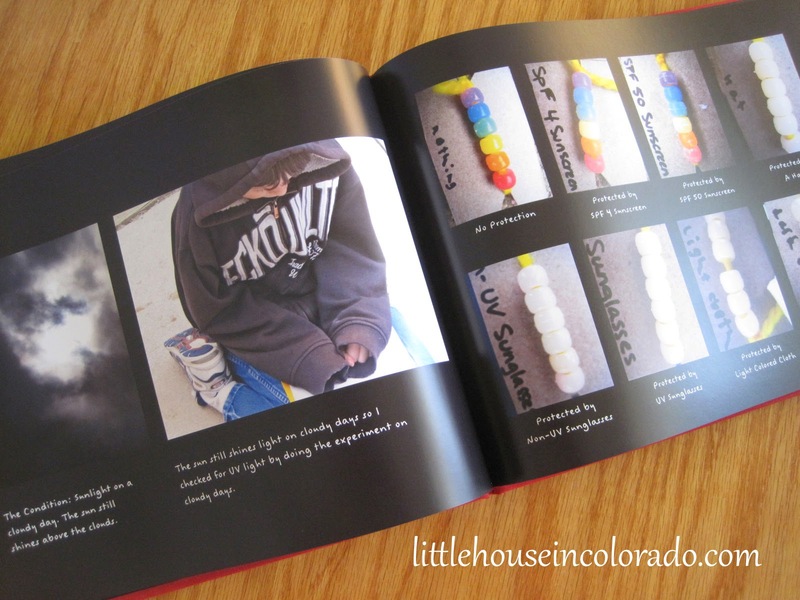 We backed the headings in red to make them stand out more and because they matched his "photo journal". The photo journal was an early idea to include pictures of the active UV beads and individual experiment results. Pictures wouldn't fit on his display board with all his data and graphs so we placed everything in a photo book from Snapfish. 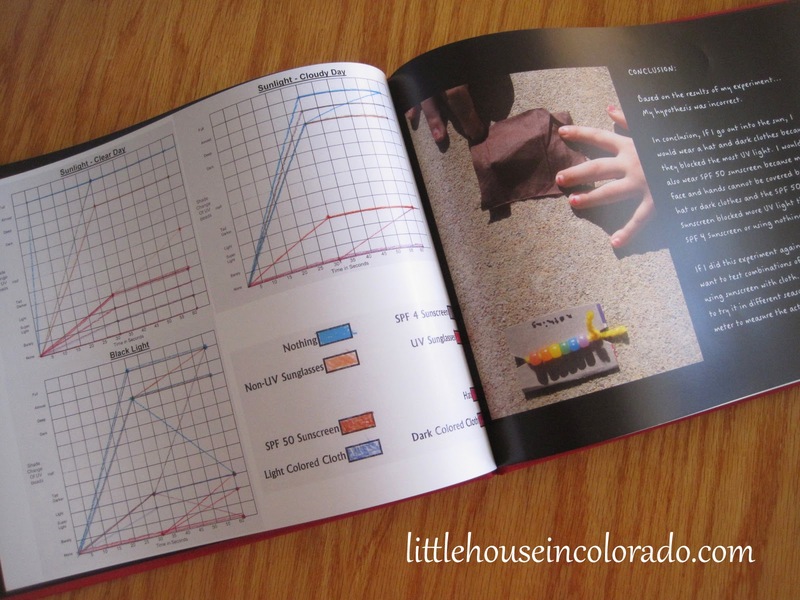 The photo journal included everything from how he came up with the idea through his hypothesis, materials, procedure, experiments, data, results and conclusion, to his "Thank You's" at the end. We thought it would make a great keepsake for later when the science fair display board is long gone. With everything else completed, we were still waiting for his graphs to show up. It was the day before the project was due when they finally showed up in the mail (next time I think I'll just have The Boy make 2 copies of each graph). School days are already hectic enough without having to add to it the frenzy from trying to properly glue on the most important part of the science fair display board. But with the graphs finally attached, the "results" section (and the entire display board) was complete. I think I was more nervous than The Boy while the judging was going on. Parents had to leave the classroom while the panel of judges questioned the students. Their verbal explanation of the experiment was worth half of the overall score and with him being the shy guy he is, well...my heart went out to him. I knew he knew the information but I was concerned with how well he'd be able to present it. He seemed to do very well and he said the judge he spoke with seemed very interested and impressed with his rundown of the experiment. I was so very proud of him! 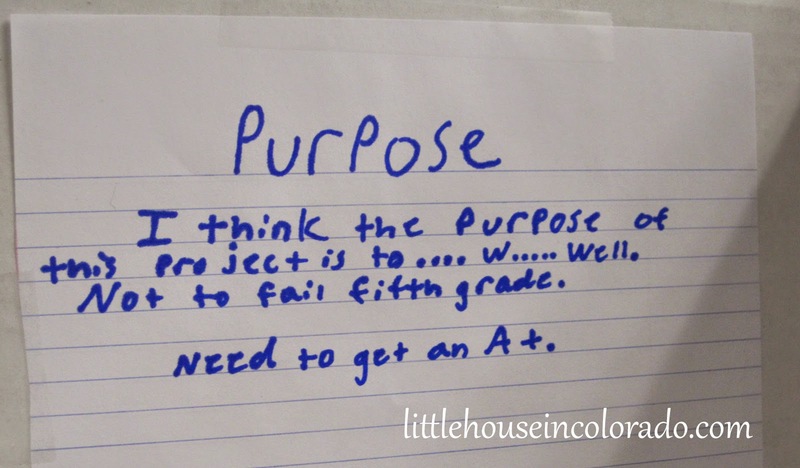 I told him later that night that I didn't have to present my projects as a kid and I'm not sure I would have survived it if I did. The kids weren't going to find out until the morning announcements today who actually won the science fair. The Boy is hoping for a 2nd or 3rd place ribbon (but he chose to wear a blue shirt to think positive for a 1st place ribbon). He knows he did well. I know he did well. 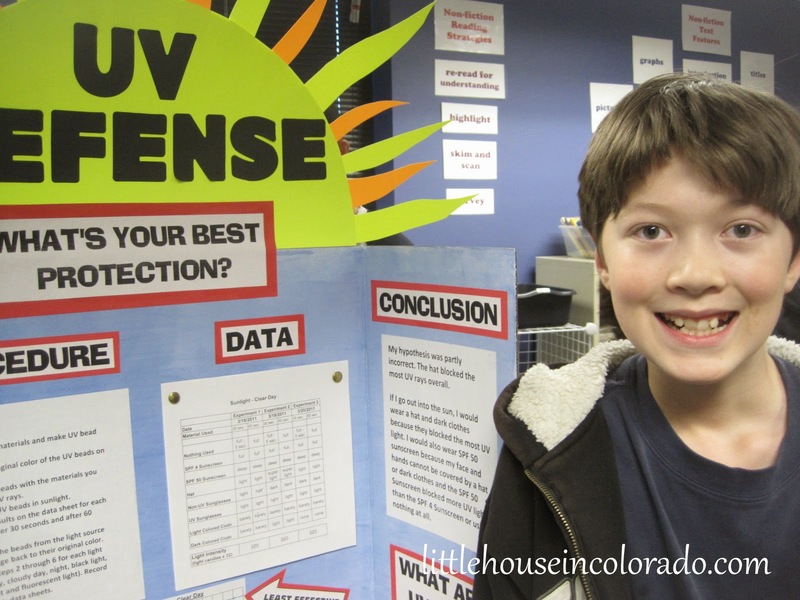 I just hope there is some confirmation from the school that he did well, too so he continues to do it in future science fairs throughout middle school. Update: The Boy brought home a second place ribbon for his project! He was very pleased except that he was "beat by a girl". There have been some requests for more details about this project. You can read the basic process for the experiment at SteveSpanglerScience.com. You can also purchase the beads from Steve Spangler or from Amazon (ours came from Steve Spangler). We changed it up a bit by adding in more "filters" in addition to the different sunscreens. We used high SPF suncreen, low SPF sunscreen, a hat, sunglasses, uv sunglasses and a black light (I think we used a light colored t-shirt as well)...the hat provided the best protection. 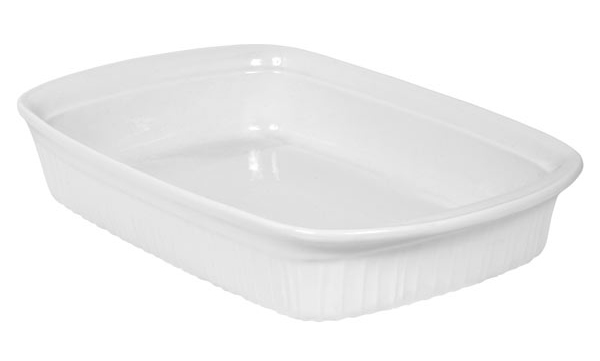 I love French White CorningWare pieces. I've wanted them for years and finally got some for Christmas last year. Then suddenly, they started to show up at my local thrift store. But why should you when you can find it at a thrift store for $4.00? The Francescan Madeira Dinnerware set was made between 1967 and 1983. I acquired a set from my parents and have been slowly adding to it. I love the chocolate brown and the olive green combo. The glassware set is VERY 70's looking so I stick to only the dishes and serving pieces. We recently agreed to participate in a multi-family yard sale. I took the opportunity to go through our piles of half unpacked boxes and re-packed the bulk of them with items (I think) we won't need until after we find our permanent Colorado home. In the midst of everything, I ran across a wheat grass stuffed googly-eyed character that The Boy received as a gift awhile ago. It's one of those sawdust stuffed characters that you can water to grow "hair". The Boy had always kept the little egg-shaped guy on his desk still in the package - never wanting to grow his "hair" because then he'd be finished with and would have to be tossed out. The little guy's sentimental value must have run out or been overtaken by the thought of finally watching his spiky green hair grow because the morning of the first day back from Spring Break, "Egg-Head" was soaked in water and placed by the window to The Boy's loud sigh of "FINALLY!" The poor guy looked like he was pleading to get out of the bag. One week later, we noticed a couple of sprouts popping up from "Egg-Head's" top so we removed him from his warm greenhouse of a zip top bag, gave him a fresh drink of water and placed him back in his sunny spot by the window among the cilantro, basil, peace lilies, violets and my hydrangea. It's a bit crowded there, but we'll hope for the best. There aren't many sunny windows in this house. I think it's because so few of the homes here have any sort of air conditioning system installed so the lack of south/west facing windows reduces the amount of heat created inside during the summer (and even spring & fall) months. The Girl is hoping he'll grow a mohawk. It didn't last too long - a couple hours maybe. And the world was again clean and white (I was all melted by the following afternoon). Ever since our first trip to Vail, Colorado in 2008 for the Vail Film Festival, Mr. LH and I have wanted to take the kids there. We never dreamed at the time that we would ever be living so close to Vail, but that's the way life works sometimes. As it happens, Mr. LH was a judge for this years Film Festival and earned a couple of passes so we planned a trip up to Vail Village over the kid's Spring Break during the 2011 Vail Film Festival. We felt a little twinge of regret at choosing this particular Saturday for our trip since Denver was expecting highs in the 70's while Vail was expected to be 20 degrees lower. The "Pickles" were so excited to pack the car with their snow gear (just in case) and "goodies" (they love having snacks in the car) that whatever regrets we had disappeared before we even got on the road. Vail, Colorado is a good 2 hour journey from our house, and while we would have preferred to have the kids looking out the car windows enjoying the beautiful views, they were good travelers with their handheld games and toys. We stopped for a break and a stretch in Georgetown where we visited last fall during our explorations. The winds were still whipping through the valley and though the kids begged to go to the fabulous playground again, we didn't stay for long. Vail was still at least an hour further down the highway. There was snow and slush everywhere and the mounds of snow on the sides of the road got higher the further west we went. It was definitely melting, though. Every once in awhile we spotted a waterfall of water coming down the mountain or streaming out of rock walls forming massive ice creations. There was still plenty of snow in Vail and there were plenty of skiers taking advantage of it! Though April is the tail end of ski season here, from the looks of things, skiers could enjoy another few weeks of the sport. Vail still boasted an 87" base - more snow than we had seen all winter in Aurora! ...and taking a walking tour of the west side of town. Once we got on the Gondola, The Girl forgot her imagined fear of heights (I have no idea when THAT started) and without their video games to keep them occupied, the "Pickles" finally looked out the clear walls of the Gondola and "ooh'd and ahh'd" at the scenery. The views from the top of Vail Mountain were breathtaking - and at 11,570 feet, they should be! That tall peak in the center of the photograph is Mt. Holy Cross - one of the fourteeners in the state. It is called Mount of the Holy Cross because natural crevices in the side of the mountain when filled in with snow, form a cross that is 1500 feet tall. We found a small wood fire outside ready to warm our chilled hands. ...then headed back down the mountain to find a pirate ship playground Mr. LH and I remembered from our previous trip. It was on the other side of town and would be a hefty walk. Mr. LH went exploring around the creek while the kids played. It was getting late and we still had one last place we wanted to stop before heading home...Moe's for dinner! I had been craving their cornbread for a long time. There is one closer to home but we just hadn't gotten around to finding it yet. By 6:15 we were on the road headed home. Some of us were a bit wet from playing in melting snow, but all of us were happy and had full bellies. We had hoped to get back before night fell but when you're having so much fun, the time seems to get away from you. The scenery on the way home was no less awe-inspiring as it was heading in the opposite direction. In fact, with the sun slowly fading and the mountain peaks catching the last rays, the view might have even been more spectacular. It was strange driving by these towering mountains and seeing the tree line so close to us. So that's where heaven is - in the Rocky Mountains west of the Continental Divide.